Pulling back the curtain on the secretive world of the global arms trade, Andrew Feinstein reveals the corruption and the cover-ups behind weapons deals ranging from the largest in history – between the British and Saudi governments – to BAE’s controversial transactions in South Africa, Tanzania and eastern Europe, and the revolving-door relationships that characterise the US Congressional-Military-Industrial Complex. He exposes in forensic detail both the formal government-to-government trade in arms and the shadow world of illicit weapons dealing – and lays bare the shocking and inextricable links between the two. 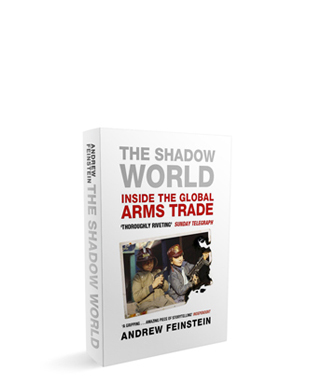 The Shadow World places us in the midst of the arms trade’s dramatic wheeling and dealing, ranging from corporate boardrooms to seedy out-of-the-way hotels via far-flung offshore havens, and reveals the profound danger this network represents to all of us. Andrew Feinstein has written an authoritative guide to the business of war. Chilling, heartbreaking and enraging. Watch the Trailer for Shadow World on the Newly Launched Film Website!